Don't let the weather stop you from riding your motorcycle this winter. 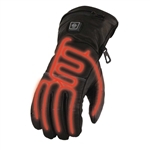 Leather Bound Online carries gauntlet motorcycle gloves made from leather and lined in order to keep your hands dry and warm. Theses gloves are perfect for fall and winter riding. Check out more styles of motorcycle gloves. Check out the warmest pair of leather motorcycle gloves: the deerskin leather motorcycle gauntlet gloves with 150 grams of toasty warm insulation.